Changes in the Offing for the NJ Site Remediation Reform Act? It finally seems likely that we’ll see some changes to the Site Remediation Reform Act (SRRA) in 2019, however the nature and extent of those changes continues to be a matter of speculation. At the behest of Senator Smith, the “father” of SRRA and the licensed site remediation professional (LSRP) program that it created, various stakeholder groups met with NJDEP throughout 2108, trying to come up with a set of consensus modifications to the ten-year-old statute. 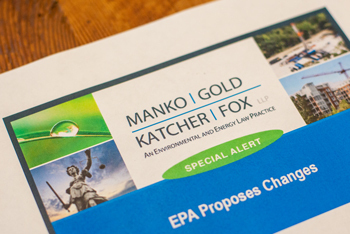 Among the more controversial topics that have been explored, but which seem lacking in any consensus are (1) providing additional flexibility to adjust or exit from the direct oversight process, (2) expanding public notification requirements and public access to LSRP files, (3) expanding and clarifying discharge reporting obligations (including those for immediate environmental concerns and discharges discovered during a buyer’s pre-purchase due diligence), (4) modifying the ISRA remediation funding surcharge requirement to cover those who provide a self-guarantee, (5) tightening the requirements surrounding what it means for an LSRP to exercise its “independent professional judgement” and several other LSRP Board sponsored changes designed to address what the Board perceives to be potential abuses of the LSRP program. Among the above, only the changes addressing discharge reporting obligations, reportedly favored by Senator Smith notwithstanding the absence of consensus, seem to show some potential at this time, assuming the Senator sticks to his other reported intention of moving only consensus changes. Non-controversial modifications, which seem likely to be part of any bill, include adding surety bonds as a permitted ISRA remediation funding source, reducing the number of required electronic copies of LSRP records to be submitted to NJDEP from three to one, eliminating language dealing with the former temporary LSRP licensing program, clarifying LSRP record retention requirements and a possibly a few minor changes to LSRP qualification requirements that could expand the pool of eligible LSRP candidates. Other controversial topics proposed by stakeholders that NJDEP has declined to consider and seem unlikely to see the light of day under the current legislative effort are (1) liability relief for volunteer remediators and bona fide prospective purchasers, (2) improvements to the remedial action permitting process and financial assurance requirements, (3) greater flexibility for addressing “non-discharge conditions” such as historic fill, historically applied pesticides, etc., and (4) acceptance of risk-based remediation strategies. The final shape of the legislation is expected to be determined during the first quarter of 2108, with a bill likely to be introduced in the first half of the year. We will continue to closely track its progress.